I would like to be able to keep up with prices of items that are differently priced at different stores. For instance, a gallon of milk at Aldi may be $1.99 while that gallon of milk is $3.29 at Wal-Mart and $3.49 at Bi-Lo. However, I am unable to mark the price of milk as different on the different store lists without the program “correcting” the price on each list. Is there a solution? Hi Jenny, thanks for your question. 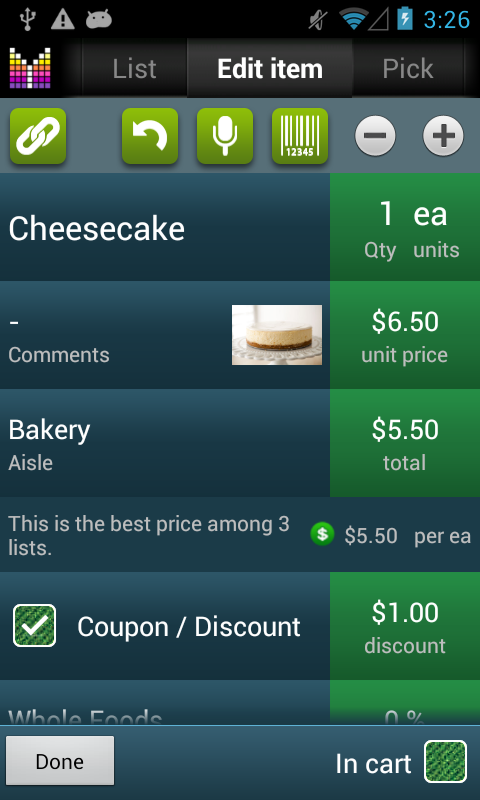 Are you using the latest version of Mighty Grocery 3.0? Changing price in one list should not affect price in other lists. Will this application allow more than one coupon to be applied per item? For instance, Walgreens will offer a $4 store coupon on razor blades and then the manufacturer will also offer a $5. You are allowed to use both coupons but is there a way to enter them separately into the application. I know I can do the math myself but the coupons have different expiration dates and frankly I just don’t like math. Hi Casey, thank you for your question. Unfortunately, adding multiple coupons for an item is not available yet. We plan on adding this feature going forward. I notice inconsisteny with respect to user experinece when they click the middle of a row on an item. In the Option settings i have ‘Edit details’ when a user ‘clicks in middle of a row’. But in a store’s Favorite list wheni click middle of a row it adds the item to the store’s shopping list when it fact i wish to edit the item (i no long tapping will do this too). But on a grocery list when i click the middle of a row it opens the edit menu as i expect. I think clicking the middle of an item in the Favorite list should behave in the same way as per the ‘Edit Details’ option setting. MrB, thanks for the heads-up. We will plan the fix for the next update. Thanks! I recently bought the paid version of your app and I must commend you on what a great app you have made! It is my absolute favorite and most used app on my new Android phone. I was wondering when I set the tax rate for a new item to “default” why does it set it to 0% taxes? I did enter taxes as 6% in Menu > Settings > Options > Regional settings > Tax rates. My question is how do i change the tax default from 0% to 6%? Hi Ngozi, thanks for your feedback! 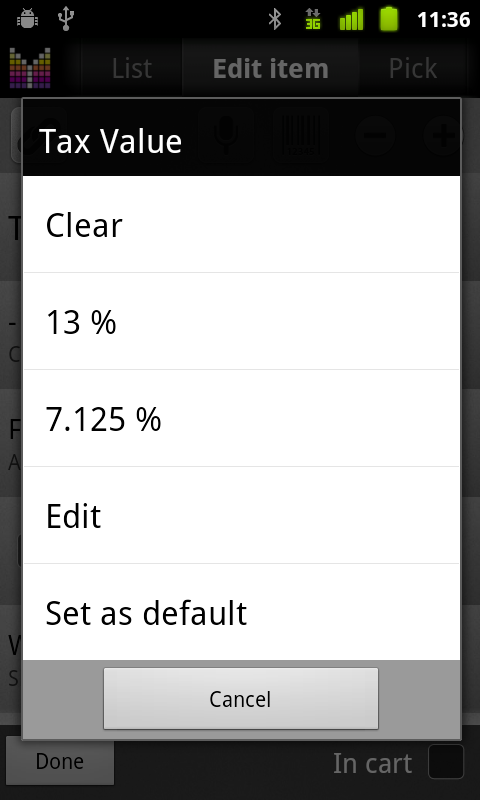 To set default Tax rate of 6%, just set tax rate of any item to 6% then tap Tax field and tap “Set as default”. This will set default tax rate to 6% for all new items. Suggestion for Coupon Expiry: Once the coupon expiry date is exceeded the application should automatically delete the coupon/discount and revert back to regular price. If it doesn’t the item with the expired coupon continues to show up as the Best Price in a price comparison. Plus the red bubble indicating the coupon exists (but has expired) becomes meaningless and serves as a distraction. Thanks! Thanks for the suggestion. We plan to deactivate expired coupons going forward when we introduce improvements to the Coupon feature. When I say “Milk, One Gallon, 4.63 cents” it will put “Milk 4.63″ in the Name of the item. Please advise, Thanks in advance! Hi KB, thanks for the heads-up. We will have a closer look into this before the next update. Thanks! Hi sorry, I am inundating you with questions. I started setting Mighty Grocery Lite up up and to test whether this system was what I was after or not (which it is by the way lol), I threw a whole heap of items into the favourites list before editing them. I then went ahead and made A LOT of edits in the pick list. I finally glanced at the favourites list and realised the changes to aisle etc hadn’t propogated across (finally read above after going nuts and realised there is a flow system of what happens first duh!! Should have read this first aye). Anyway rather than reloading all the data into my favourites items so they match the pick list I was wondering if there was an easy way of quickly clearing all items out my favourites list and starting afresh. I planned on removing all items from my favourites, finishing all my edits in the pick list and then throwing them back over to the favourites list for future edits. I know I can unlink then delete items individually from favourites without it affecting the pick list but that is going to be a time consuming job. Melanie, you can delete all items in a list under Menu > Delete all. To quickly add items from Pick list, just go to Pick list and select destination list or favorite list on the top. Please let me know if you have any further questions or comments. 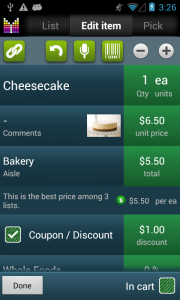 Grocery start using 5 for 3.00$ for fruits. I would like to enter this instead of having to calculate. Same for cereal they offer 2 box of 500g for 6.99. I would like the application do the math for me. HI there! Thanks for your questions. Kindly note that it will be possible to enter package size for price compare in the next update. Keep your eye on the What’s new page for the news. As for entering 5 / $3 type of prices, just enter “5” in Qty field and tap “Total price” field and enter 3. The app will compute Unit price automatically. For cereal, enter Qty = 2, Units = boxes and Total price = 6.99. Hopefully this helps. Hi Tom, thanks so much for your feedback. No, Mighty Grocery does not have built-in barcode scanner and requires Barcode Scanner app to be installed. Please see Barcode Scanner User’s Guide for more details. Hello – I’m learning to use the app and think it’s great, but I’m having trouble finding out if there is a way to separate the discount from the coupon. 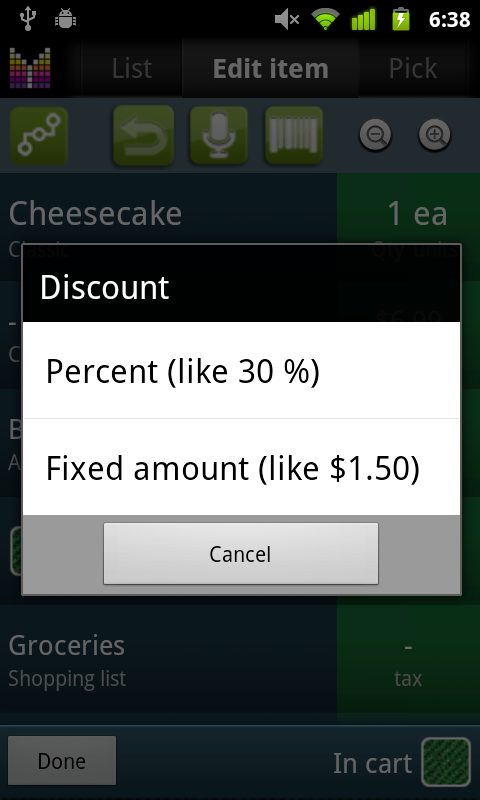 I’m guessing I just can’t find it here.n some instances taxes are charged differently on discounts versus coupons. I have tried changing units, etc but that is not solving the problem. Hope this makes sense and thanks in advance. Kathy, unfortunately there can be only one discount option — discount or coupon. However, it is possible to change taxing behavior. 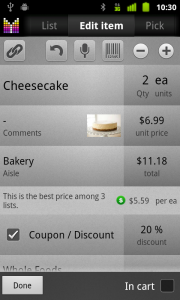 Just add a coupon or discount and tap Coupon/discount field again. One of the options is “Apply tax before discount”. Hopefully this helps.